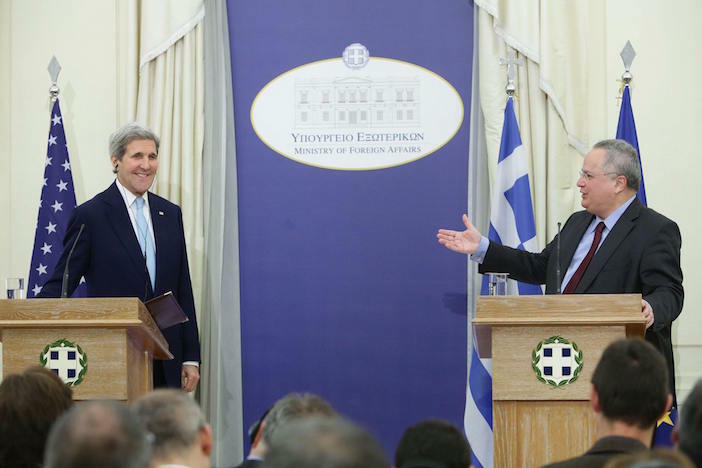 Praising their response to the refugee crisis amidst one of the worst economic crises in history, U.S. Secretary of State John Kerry praised the “resilience and warmth” of the Greek people during his visit to Athens on December 4, 2015. 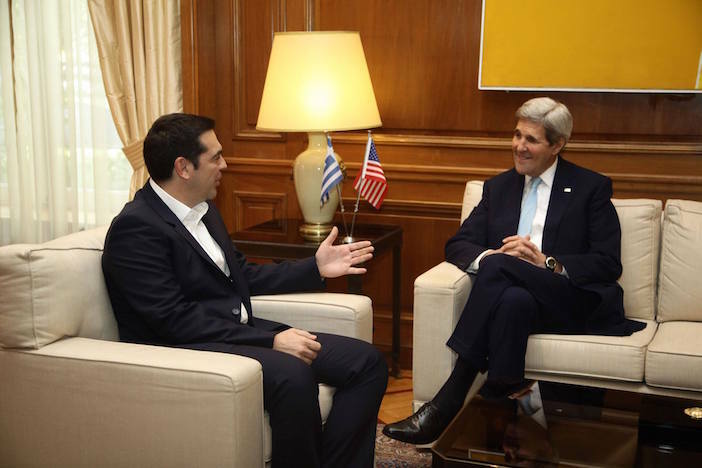 “With my visit today, I want to commend the resilience and the warmth of the Greek people. As you work your way out of one of the worst economic crises in your history, Greece has opened its doors to refugees and migrants escaping the fighting in Syria and neighboring countries. And the United States is very proud to stand shoulder to shoulder with you as partners and as friends,” Kerry said in a press conference following a meeting with his Greek counterpart Nikos Kotzias, the Greek foreign minister. U.S. Secretary of State John Kerry and Greek Foreign Minister Nikos Kotzias speak to the press at a news conference at the Greek Ministry of Foreign Affairs after their meeting in Athens, Greece. While in Athens, Kerry visited a central Athens organization called Melissa Network where volunteers work with refugee women to help them during their stay in Athens as well as helping them integrate into Greek society. 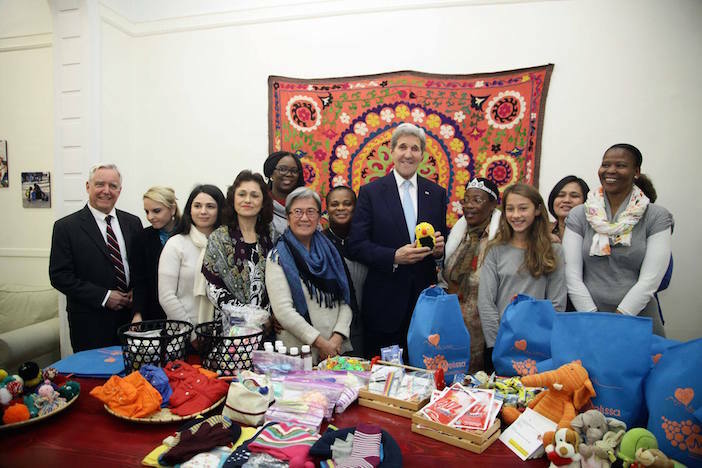 Kerry helped stuff nap-sacks that will be given to refugee mothers with children. U.S. Secretary of State John Kerry poses for a photo with workers at the Melissa Network, a migrant aid group staffed by former migrants, while in Athens, Greece. “We will support and build on the remarkable work of Greek organizations like the one that I visited this morning downtown, the Melissa Network. I was just really very touched and moved by the women and one young girl who were working there in order to help migrant and refugee women integrate into Greek society or be able to find the help that they need as they move on to yet another country and another future,” Kerry said. Kerry also announced an additional $24 million in aid to the UN High Commissioner for Refugees, which will support UNHCR’s efforts in Greece, in the Balkans, and in other immediately impacted parts of Europe, including it will help support the creation of reception facilities for refugees and migrants and the provision of lifesaving aids such as food, water, temporary shelter, and healthcare. 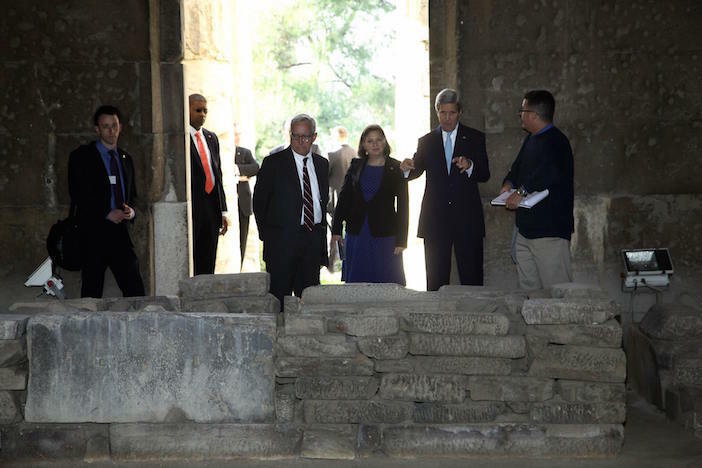 During his visit, he met with Greek prime minister Alexis Tsipras, held talks with his Greek counterpart, Greek foreign minister Nikos Kotzias, and took time to visit the Temple of Hephaestus where he was given a quick lesson on the origins of Athenian democracy by Dr. Kevin Daly of the American School of Classical Studies.